Everyone that has tinkered with a 4049 IC knows there are six inverters onboard. Most distortion designs for this chip use two or three stages and shunt the others. It has always been an idea to utilize all the stages on the IC to avoid wasting the unused inverters. There has been much discussion on Aron's Forum about using all six stages or various configurations for getting the most from this chip. There aren't any published designs showing this, so RunoffGroove set out to see what was possible. Design goals were established before and during the designing phase. The first goal was to utilize all the inverters we could on the 4049 chip. The second goal was to have 1M or better input impedance. The third goal was to have a buffered output to avoid loading the inverters. We tried using all six stages in series, but the level of hiss was incredibly high. Good tones were there, but the noise level was too much. We discovered the maximum limit for a well-behaved circuit was around four inverters in series. Even then, the noise was pretty high. Looking back at other designs using the 4049, we decided. the maximum number of stages needed would be two or three. A simple Jfet common source input stage could drive the inverters into a heavy overdrive, as proven by Frank Clarke's Hot Harmonics design. The layout of our chosen CD4049UBE chip has all the inverters facing the same way. This layout lends itself nicely to running two parallel channels. The idea was firmly in place at this point, so we set out to make two switchable channels, using two or all three inverters on each side of the IC. We wanted two independent overdrive channels, with gain and volume controls for each. We wanted one channel to sound very amp-like in the classic style. The sound of overdriven Fenders, Marshalls, etc. were a target sound. For the other channel, we wanted something a little more "over-the-top." We wanted a very high gain sound, with a smooth top. Something along the lines of the older Boogie amps. For simplicity's sake (the RunoffGroove prime directive), we chose to use a common input stage and buffer. We decided to switch the inverters in and out to facilitate the channel switching idea. Jfets were chosen as the input stage and buffer due to the favorable sound and electrical properties, along with fewer required parts. The Double D is born! We were able to develop a two inverter channel, "Jiggle" with a lot of classic amp-like sounds at various settings of the gain knob. The other channel, "Bounce" uses three inverters to crank the gain up higher. Caps were used over the inverters to mellow the clipping out. We've implemented Mark Hammer's suggestion of rolling the treble back more in earlier clipping stages and less in subsequent ones. This helped bring out the amp-like sounds and removed the harsh, "fizzy" high end of the bare circuit. There is certainly no lack of highs at the output. The typical "piercing" highs of classic amps dimed are still present. Dynamic response is really good and grit can be controlled from the guitar volume knob. There is one down side to this design, as plagues many 4049/4069 designs: The current consumption is high. We measured 22.8mA on one of the prototypes. We have not determined the expected lifespan of a 9V, but it will be less than many other distortion units. Due to the high current draw, we recommend using a 9V adapter. You can try some of the suggestions posted on Aron's Stompbox Forum by Tim Escobedo and Gez Paton, among others. They've recently mentioned trying various methods of controlling the power supplied to the 4049 to reduce current consumption. 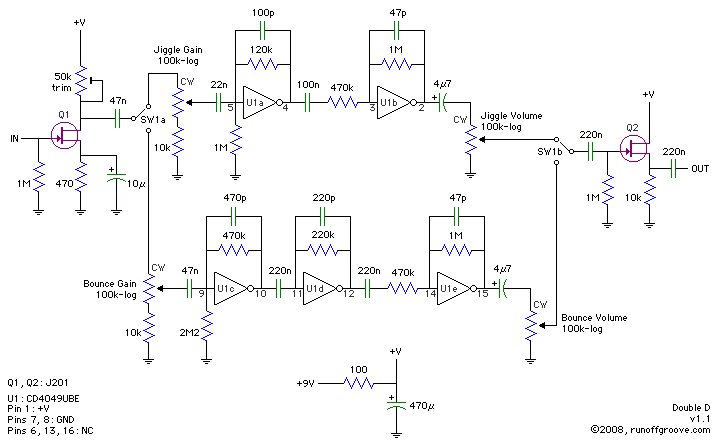 This circuit was independently confirmed to work properly using the values and parts shown. We cannot be sure any modified values or substitute parts will work the same as the prototypes. Alter values/substitute parts at your own risk! 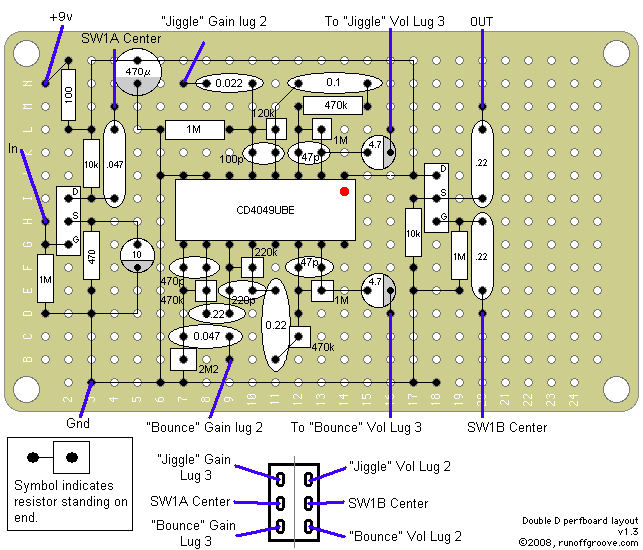 Use a 3PDT footswitch for SW1 on the schematic. With this switch, you can have channel switching, plus an LED indicator to show which channel is active. A red/green Bi-color LED would be convenient for this function. Ricky Don Vance (a.k.a. 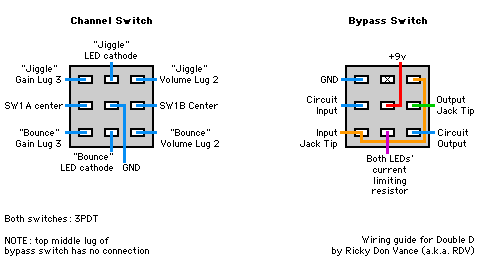 RDV) kindly shared his method of wiring two 3PDT switches to provide bypass and channel switching with LED indicators. Note that you'll need to determine the proper LED current limiting resistors yourself. Add in your favorite tone stacks for each channel. A good way to implement this would be to make a preamp. For ease of construction, we chose to make this circuit a pedal, but the preamp idea will work nicely. You can put the power supply into the preamp chassis for convenience. Will Percival also contributed a PCB layout (PDF, 216k) for the Double D.
The 10k resistors between lug 1 of each channel's gain pot and ground are not shown on the layout. The resistors can be attached between lug 1 and the pot cover, with a wire then connected to ground. Double D by runoffgroove.com is licensed under a Creative Commons Attribution-NonCommercial-ShareAlike 3.0 Unported License.